Hands are a big deal. This past summer Rebecca and I worked on a public mural, commissioned by Indiana Sports Corp for USA Diving. This was to commemorate the 2016 USA Olympic Diving Team Trials. The event took place here in Indy at the IU Natatorium during the month of June. Rebecca and I set up our painting studio in the H2O Zone during the trials and we gave every visitor a chance to take a brush in hand and dab some paint on the canvas which measures 5 x 5 feet. This canvas can be seen taking over the upper left hand corner of the image above. The design is focused on a pointillist (painted dots of color) rendering of one of the competition diving boards used during the event. This is surrounded by dots of blue, green, and purple pigment organized in concentric circles. These circles refer to the spot in the pool where the diver enters the water. We lived with the development of this design for months. I put the varnish layers on it in my studio. On the day the mural was to be presented to the wonderful folks at USA Diving I took it by my father’s house so he could see it. My sister Mimi came out to help me carry it in and we took it back to his room. He looked at it and held his 96-year-old hand out gesturing that he wanted to touch it. And, in that moment I forgot all about the countless hours that went into the design and painting of the work. I’ve actually spent some time going through our documentation to find the best images that reflect the beauty of this project. But I kept coming back to this blurred snapshot of my dad with his outstretched hand mirrored by the exposed forearms of my big brother James in the background. The legs of my brother Vincent (the actor living and working in Hollywood – Google him) can be seen to the left of the photo. 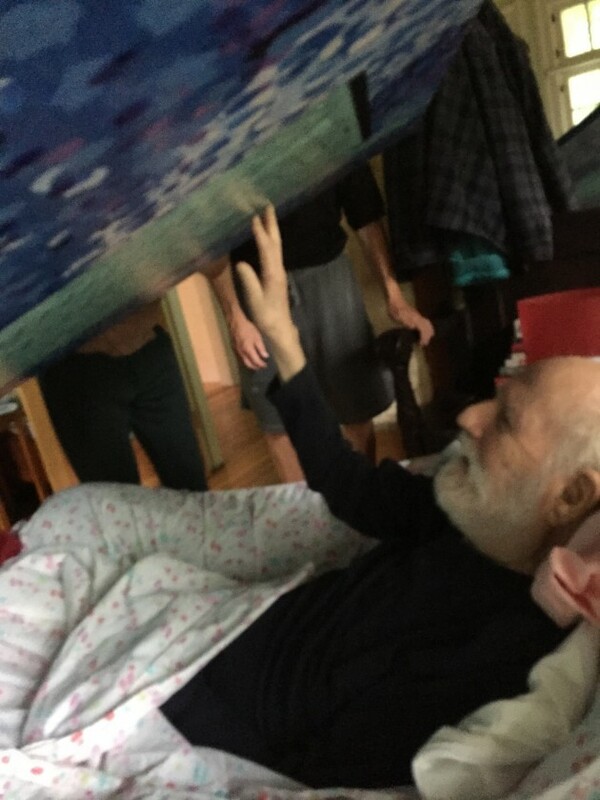 He’s holding up the canvas with my sister so dad can “see it” with his fingers. Unseen on the wall behind the suspended mural is a large framed photograph of my mother’s hands, one on top of the other, taken by Rebecca years ago during a portrait session. And then there are my own hands holding the camera that is taking the picture. The blurring is caused by the photographer not knowing what to focus on and thereby confusing the auto focus. With so much to see and take in how could I choose in a room full of big deal hands? Yeah, that hand in the center held me as a baby. It showed me how to draw with a pencil on paper place mats at the Knife and Folk (which is where the CVS now stands at the corner of College and Broadripple Avenue). Yeah, that was the hand that taught me how to lead a partner when dancing, how to pull peas out of a pea pod, how to change a spark plug, and a hundred other disappearing skills. I remember seeing my father diving into a pool in the middle of the Nevada desert but I had completely forgotten that until this moment. My dad couldn’t make it to the Nat to see the divers do their work and perform their art as their hands reached out upon entering the water. I don’t think my dad was considering the guts it takes to jump off the ten metre platform? But, all these thoughts, and lives, and hands became of one thing inside me as I pushed the button on my camera.